The story begins in the Year 2017 a.t.b.. The wrath of the Britannian assault had encouraged the other nations to take up arms against one another, fearing that they too would share the same fate as Japan. Instead of coming together in reason, the three nations not only rose up against each other, but in haste, they elected a leader that would lead them to victory in this time of terror. The Britannian Empire remained strong as their current leader waged the flag amongst the world. The shear might of their military was one of the key reasons that provoked the other nations to pick up arms. The Chinese Federation held fast to their Emperor as well, as they prepared to wage war against any that would threaten their land. However, the federation remained calm as their numbers of armed soldiers readied themselves, allowing anyone to strike the first blow. The Once European Union has now formed a system of monarchy like the other two nations, and their will to fight will indefinitely rise to match the other nations. The Holy Britannian Empire attacked out of fear, with the provoker still yet unknown. With the other unconquered pieces of land now mixed up in the chaos of war, the remaining countries were also reduced to areas, until they were either taken under control by another country, or made an alliance with one of the three big nations. In this world, none of the canon characters exist. This is simply a spin off plot of the original story. Therefore, you are free to do as you please; become the agent of destruction, or the herald of peace. Nightmare Frames: That's right. you too can pilot these powerful Gundam-like weapons. With it, you can defeat all of those who would stand in your way. You can even take over Areas and claim them for your homeland, or for just yourself. Warships: Yes, you can take command of a warship and fly through the heavens as you and your crew take on what life throws at you. Or, take down countless Nightmares Frames and battles other great warships as well. The power is within your hands. Areas: Just like in the show you can conquer many Areas for your homeland, or just take control of them for yourself, gaining power. 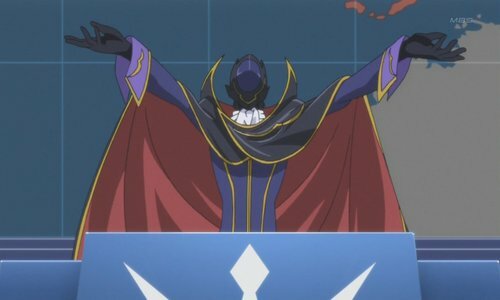 Geass: The power of the Kings can be yours as well, you just have to meet the right person in order to get it. With it, you can gain a power that is unique and reflects you. Immortals: If your life happens to stumble upon this supernatural state of being, then you can walk the lonely road of Immortality, or so you think.